As a nod to the Air Max Plus from 1998, Nike created the hybrid Air VaporMax Plus silhouette. For its latest release, the shoe arrives in a bumblebee color scheme. It features a Yellow-based upper with a Black molded TPU cage as a direct callback to the original 1998 design. 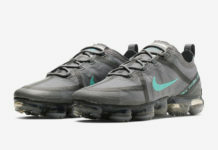 A Yellow midsole atop a clear-to-Black full-length VaporMax sole unit completes the design. Check out the official photos below, and look for this VaporMax Plus to release in the coming weeks at select retailers and Nike.com. The retail price tag is set at $190 USD.